A whole golden, succulent roast organic turkey: the classic Christmas centrepiece. Our birds are the much-celebrated Bronze breed: a slow-growing traditional turkey that gives rich, juicy meat with an intense natural flavour. We include the giblets, so you can top off your roast with the absolute best proper gravy. Here are some simple tips from our cooks here at the farm for cooking the perfect roast and making a sumptuous organic gravy too. – Remove and freeze the giblets as soon as the turkey arrives (defrost in time to make your gravy). – Allow the turkey as much air as possible, preferably by untying it to let air into the cavity. – Take the turkey out of the fridge 30 mins before cooking. – Untie the bird before roasting, or it will increase the cooking time. – If the turkey has been frozen, defrost thoroughly in the fridge or a cold place before cooking. – Don’t use the cavity space for stuffing – it slows down cooking, absorbs fat and will mess up the gravy. Instead use the neck cavity. – Remove cooked leftovers from the carcass and put them in the fridge as soon as possible. Eat within two days. If you cook with leftover turkey, make sure it is piping hot. – Make sure you save all your turkey bones to make stock with, if you are planning more than one Christmas feast it will make the perfect addition to future gravies. Here’s an easy way to work out the cooking time without trying to balance a turkey on your kitchen scales! Each bird will already have its total weight on the label, so remove the giblets, weigh them separately and deduct their weight from the total. Add the weight of your stuffing (if using) to get the right cooking time. You will need to cook your turkey for 45 mins per kg. Preheat the oven to 190°C/Gas 5. Remove the giblets if you didn’t remove them on arrival (keep them for your gravy). Lift the flap of skin at the neck end and pack in your stuffing, then pull the skin back and secure under the bird, using wooden cocktail sticks if necessary. Season the main cavity, then push in the quartered lemon, onion and herbs. Transfer to a large roasting tin, breast-side up, and brush the breast and legs with the melted butter before seasoning. Cover the whole bird loosely with foil to protect the skin from over-browning, and transfer to the oven for the calculated time. Every hour baste with its juices. 30 mins before the end of the cooking time, remove the foil to allow the skin to brown up. At the end of the cooking time, check the meat is thoroughly cooked by inserting a carving fork into the thickest area of both breast and thighs. If the juices run pink, return to the oven for a further 15 mins and test again. Repeat until the juices run clear. Once cooked, remove it from the roasting tray (you will need this tray for making your gravy in so don’t wash it!) and put it on another tray or plate. Cover the turkey with foil again and leave to rest for 30 mins. This will make it more succulent and easier to carve… and don’t worry, your turkey will stay hot for an hour after leaving the oven. To make perfect gravy you need to make sure you capture all the flavour the roasted bird has left behind. Using the tray you roasted the turkey in, skim most of the fat out – although leaving a little won’t hurt. Place the tray over a medium hob and sprinkle 1 tablespoon of plain flour into the meat juices. If you like your gravy on the thick side, you can add more flour. Cook for a minute or so and tip in a small glass of white wine. Let it bubble away until it has reduced by half, using a wooden spoon to scrape and loosen all the interesting, sticky, roasting debris from the pan. Add about 500ml of good poultry stock along with any resting juices from the turkey. Let it simmer away until thickened, then adjust the seasoning with salt and pepper. To create gravy just the way you like it, tweak the flavour with a little mustard, or a dash of red wine vinegar to add more piquancy. A little soy, Worcestershire sauce or even miso paste can add more depth if you feel it is lacking. Some people like to sweeten a Christmas gravy with a dab of redcurrant jelly or a tangle of slow-cooked onions. When it tastes just right, enjoy it with your festive feast! We’ve selected our favourite Christmas leftover recipes to help you make the most of any turkey or ham you might still have left on Boxing Day. A great Boxing day brunch dish. Leave out the hollandaise if you like, or if you’re not confident cooking poached eggs, you can fry them instead. A tasty favourite with a turkey twist. Makes a great recipe for using up the remains of a roast dinner, or substitute leftover goose or turkey after Christmas. Feel like it’s time for a Mexican twist? 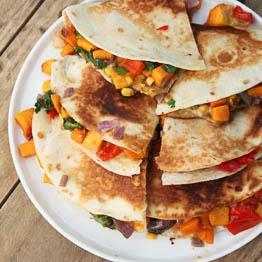 Try our turkey quesadilla recipe to add a little spice to the festive season. This hearty, warming soup uses up the scraps left over from a roast. We’ve got five great veggie centrepiece recipes to treat your vegetarian friends or family for Christmas dinner on the big day. Pithivier is a French pie made with puff pastry. Traditionally sweet, this one has a smoky cheese and leek filling. It’s hearty and rich and makes a great showstopper for the big day. This pie is easily prepared in advance and put into the oven just ahead of dinner. The feta makes sure the spinach and kale are moorish and creamy, while the chestnuts give it texture. These individual pies look smart when served and are great for impressing festive guests. Roasted squash is one of our favourite things and together with chard and soft cheese, it’s hard to go wrong with this dish. Sweet leeks and soft pastry work together in this dish to create a warming and satisfying centerpiece. It’s quickly and easily prepared ready to go straight into the oven so you can get on with enjoying the day. A classic dish done up for Christmas. With caramelised onions, softly roasted veg and a crispy and filling batter, this dish is just the thing on a cold Christmas day. Be sure to send us photos of any of the dishes you make, we love to see what you’ve made! 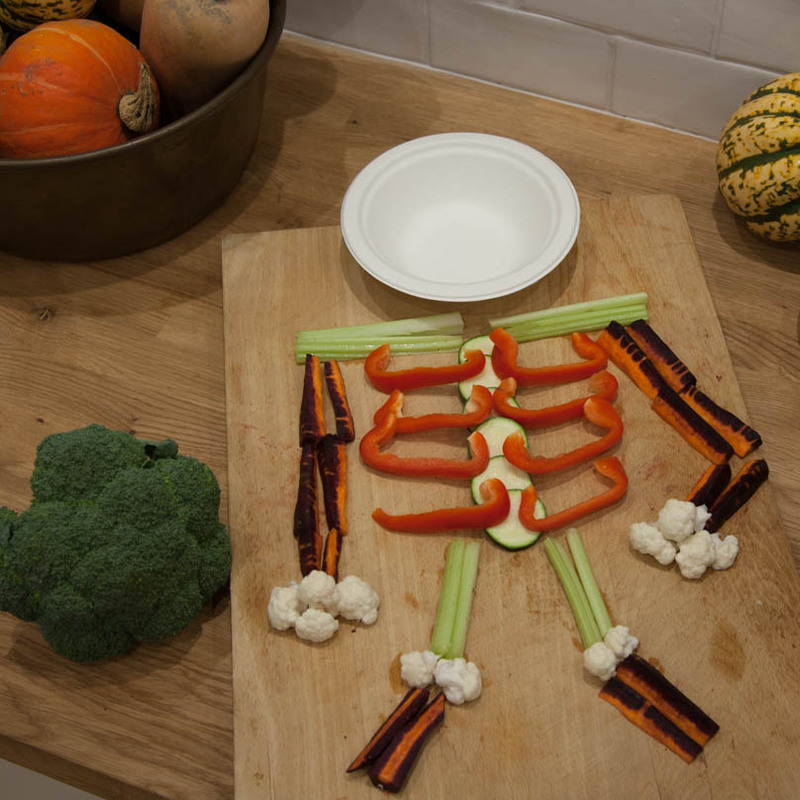 Crafty Halloween idea: Spooktacular Salad! 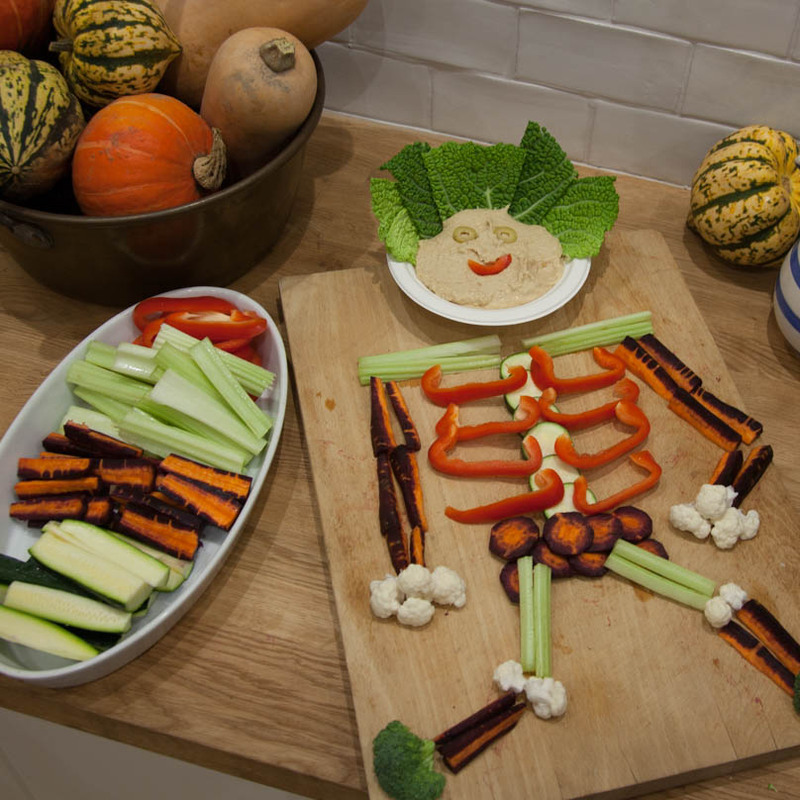 Treat hungry trick or treaters to something to tuck into with our creepy skeleton salad bits & dip! This spooktacular salad is simple to make and is a great healthy treat for hungry trick-or-treaters. Kids can get hands-on arranging the different bones to create their own creepy creature! 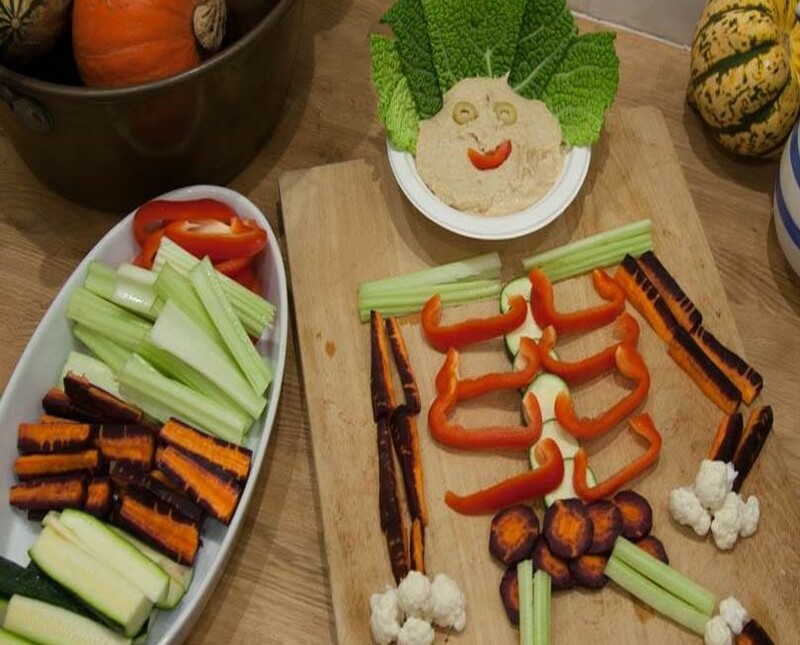 Send us a photo of your creepy creations on Twitter or Facebook using #healthyhalloween. We’d love to see what you come up with! Step 1: Cut up the different components ready to arrange on a plate or chopping board. Step 2: Start arranging your skeleton. Find a bowl for the head, it’ll be filled with dip later, but it’s great to get an idea of scale for the skeleton’s bones. 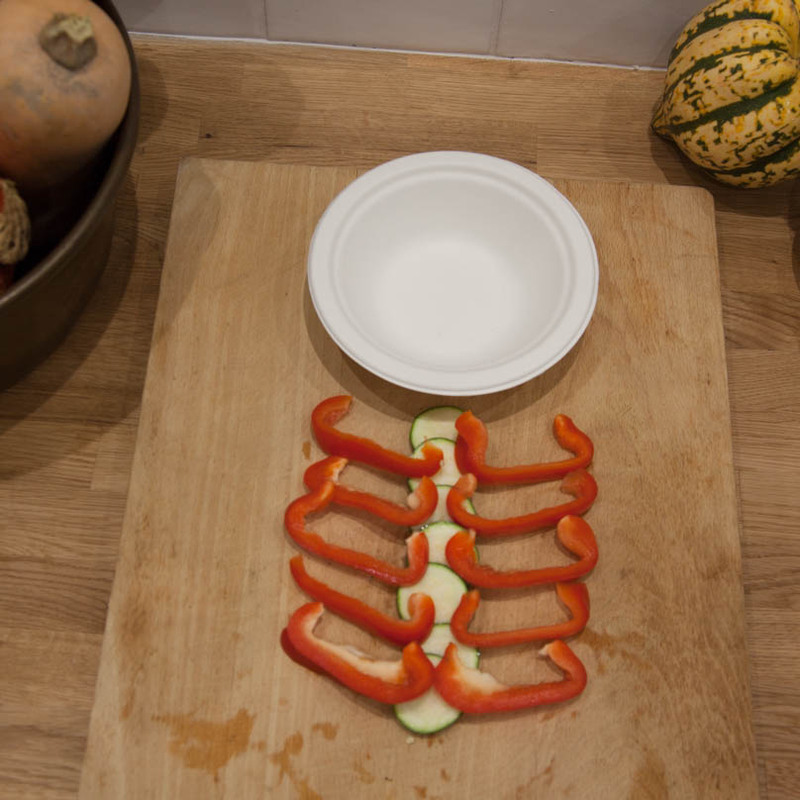 Courgettes cut into disks make a great spine, and red peppers are perfect for ribs. Step 3: Add arms and legs using celery and carrots. Cauliflower and broccoli are a great way of creating hands and feet. Step 4: Fill your bowl with dip and position as the skeleton’s head. 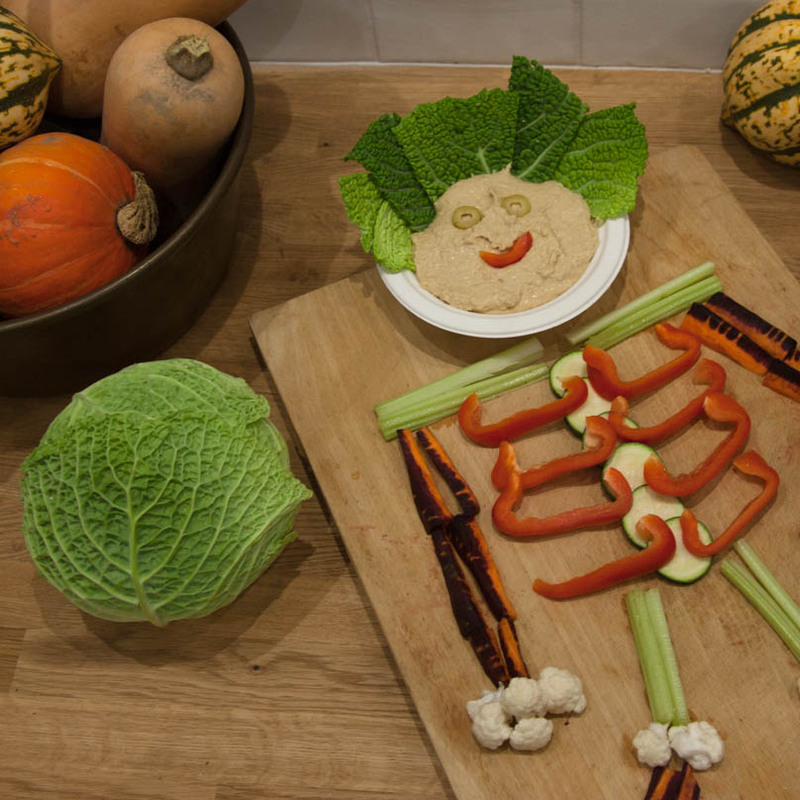 Step 5: Use cabbage or lettuce leaves for the hair and sliced olives for the skeleton’s eyes. An off-cut from the pepper is perfect as a smiley mouth. Step 6: Chop up any spare veg and put in a side bowl for everyone to get stuck in! 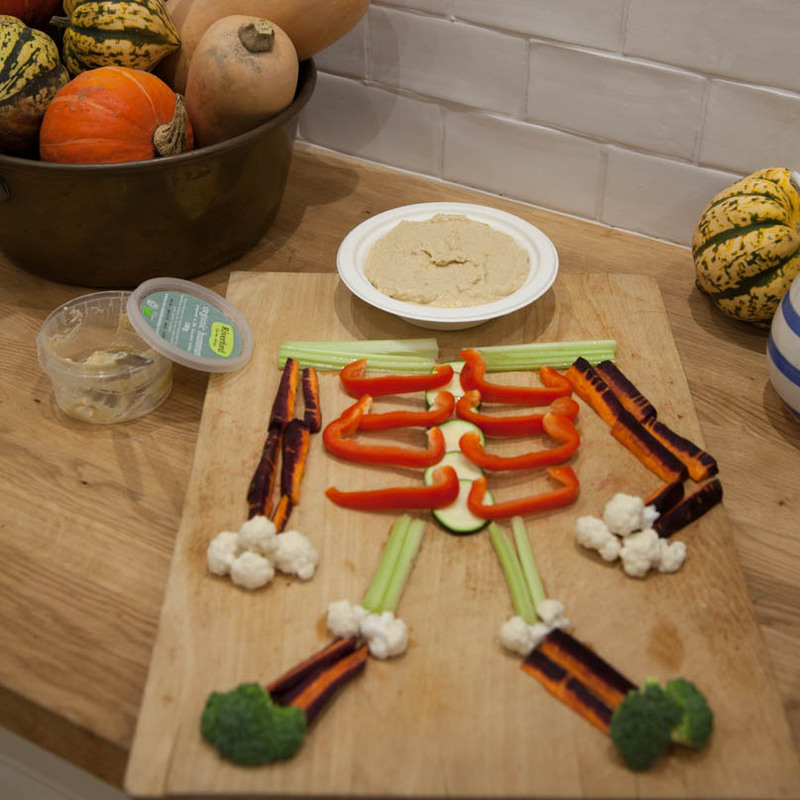 Tuck into your tasty skeleton! Have a great Halloween and don’t forget to send us a photo! The pick of the our seasonal vegetables to fuel your new year cooking. 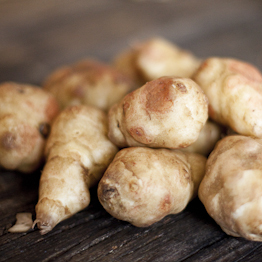 These knobbly little roots are a farmer’s dream: easy to grow, with no significant pests or diseases. They do particularly well at Wash Farm – in fact our biggest challenge is keeping them under control. They have a nutty, sweet, almost mushroomy flavour. Peel or scrub them, then use in stews and soups. They’re also good roasted in olive oil or sliced thinly and eaten raw in salads. Or try our recipe for jerusalem artichokes and mushrooms in a bag with goat’s cheese. Another cosmetically-challenged seasonal root (although who looks their best in January anyway? ), grown around our Riverford farms. Celeriac endures winter well and has a delicate, celery-like, fragrant flavour. It will keep in the bottom of your fridge for several weeks. Use celeriac to add depth to stews, mash and gratins or try our recipe for spiced celeriac with lemon. Man cannot live on roots alone, so welcome the dark green leafiness of the kales. They benefit from slow growth and are at their best after some hard winter weather. This year our cavolo nero (black kale) is all but over, so look out instead for other varieties, including curly kale, which can be as good as cavolo nero once it has had plenty of frost. Store it in the fridge and eat it within a few days. You will normally need to discard the stalks before cooking – hold the stalk in one hand and run your other hand down it, stripping off the leaves. Curly kale is best boiled briefly or used in hearty, peasantstyle soups and stews. Try our easy ideas for kale. Remoulade sounds impressive but it’s really simple. Watch Guy Watson make the starter from our Valentine’s menu. In this week’s video, Guy Watson shows you how to cook celeriac soup. In this week’s video, Guy talks about parsnips. We’ve just started harvesting these this week. You can start lifting them in September but as it gets colder, they get sweeter. They’re at their best around January and are in season until around March. Toward the end of the season they start to get a bit ‘woody’ as they re-grow from the top so the core starts to get a bit tough. If you find them to be a bit tough in February or March, it’s worth quartering them and taking out the core. Parsnips have a sweet flavour and the simplest and best way to use them is to roast them. They also make a good purée and sweetness goes well with spices. In this week’s video, Guy talks about radicchio and gives tips and ideas on using it. These grow really well in Autumn, after the lettuce season is over. The cannon ball like Chioggia are most commonly sold in the UK but we prefer these tall, cos shaped radicchio known as Treviso. It does have a really bitter flavour, so can be used raw in salad, but in a small quantity with a sweet dressing or with fruit or roast squash. If you do find it too bitter to use in a salad, it can be cooked. Try our recipes for grilled radicchio, radicchio and red wine risotto and radicchio pasta or order radicchio on our website. In this week’s video, Jane gives you tips on using sweetcorn, savoy cabbage and calabrese broccoli. Here is our recipe for creamed corn with cumin and thyme. Try cooking it in a little bit of oil with bacon and caraway seeds. Cook the seeds and bacon, then when the seeds start to pop, throw in the shredded, washed cabbage and sweat it down for 5 minutes. Try this recipe for Annie O’Carroll’s roast calabrese with chilli and soy.